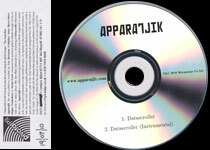 Apparatjik released the download single "Datascroller". The artwork is red with part of a sentence printed in large white letters and cut off on the right hand side of the sleeve. 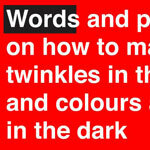 The words you can read are "Words and on how to twinkles in and colours in the dark". "Words is printed over a black rectangle in the top left hand corner. The release features the track "Datascroller" (2:58). There is also a promo single which has a white sleeve with "Apparatjik" printed in red towards the top and "Datascroller" printed in black underneath. The back of the sleeve is white with titles in black. The disc is plain silver with black text. It comes with a promo sticker with information on the band. The release date has been corrected by hand from 11 July to 19 July. It features the "instrumental" (2:58) version of "Datascroller" in addition to the regular version.